Hey, it’s almost the end of the season and I’ve still got empty jars. I did a tomato jam last year too: that version had a sweet and spicy combination of peaches and peppers in with the tomatoes. It was more like a fancy ketchup than an honest to goodness jam. This one, however, is jam through and through. It treats the tomato like the fruit it really is. 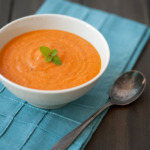 If you closed your eyes and ate a spoonful you almost wouldn’t guess it was tomato. Some oddly savory strawberry or something. So yes, it’s very sweet, which puts it in an odd middle-ground between fruit preserves and tomato sauce. It could really go either way. Spread it on a biscuit. Or better yet, spread it on a biscuit, top it with some bacon and arugula, and call it the fanciest BLT you ever did see (and subsequently eat). Tomato jam makes the ultimate grilled cheese – it’s like having your soup and sandwich in one deliciously toasty package. And, a burger? How good would these be slathered on a juicy burger? For what it’s worth, this is a pretty loose jam, too. Much like the peach lavender jam from earlier this summer. Any and all pectin in this comes from the lemons. So maybe I didn’t cook it long enough or maybe I should have thrown in another lemon for good measure, but it is nice not to have to deal with pectin for once. Next year, though, I may play with the texture a bit. This has big chunks of almost jewel-like tomato and tomato skins floating in a sweet jammy syrup. A quick run through a food mill might make it more of a smooth, tomato-jam-butter type spread. But however you prepare it, you won’t be disappointed. 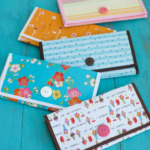 Be sure to click through for the recipe and free printable labels! Yippee! *If you don’t have any mixed pickling spices, a combination of cinnamon sticks, peppercorns, whole cloves, bay leaf, mustard seeds, whole allspice, whole coriander, and maybe some whole dill, juniper berries, cardamom, or caraway seeds in a similar quantity will work just fine. Whole spices are preferable because you want to be able to remove them from the syrup before canning. Tie spices and fresh ginger in a square of cheesecloth, creating a spice bag. 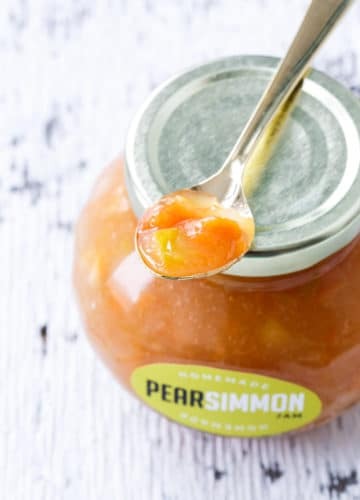 In a large non-reactive saucepan, combine sugar, lemon slices, water, and spice bag and bring to a boil over high heat, stirring until sugar is dissolved. Reduce heat to medium-high and boil gently for 15 minutes. Add tomatoes and simmer, stirring occasionally, until tomatoes become transparent, about 20 minutes. Remove from heat, cover and let stand 12 to 18 hours in a cool place. Prepare canner and wash/sterilize 6 half-pint mason (or equivalent) jars. Keep jars in hot (not boiling) water until ready to use. Pour mixture through a fine mesh sieve to separate syrup, or use a slotted spoon to remove solids and set aside. Discard spice bag. Bring syrup to a boil over high heat, stirring constantly. Boil hard for about 3 minutes, or until thickened. Return tomatoes and lemon to syrup; return to a boil and boil hard for 1 minute. Remove from heat and skim foam (if necessary). Carefully place one lemon slice in the bottom of each jar. Ladle hot jam on top, leaving 1/4-inch of headspace. Wipe jar rims and threads. Screw on lids and rings. Process in a boiling water bath for 20 minutes. Remove from water and let cool completely, 12 to 24 hours. Check seals. 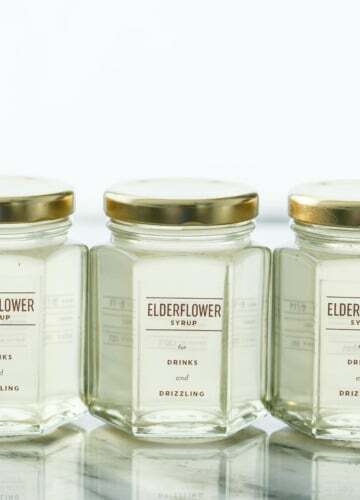 Any unsealed jars should be refrigerated and used within 3 weeks. Recipe from Ball Complete Book of Home Preserving via Bunkycooks. Bonus! I probably don’t need to tell you this jam is gorgeous on its own. But add a label and it makes it look like you bought it in a fancy gourmet food store. Can you say, fabulous gift? I for one love giving homemade jam in lieu of wine or nick-knacks during the holidays. 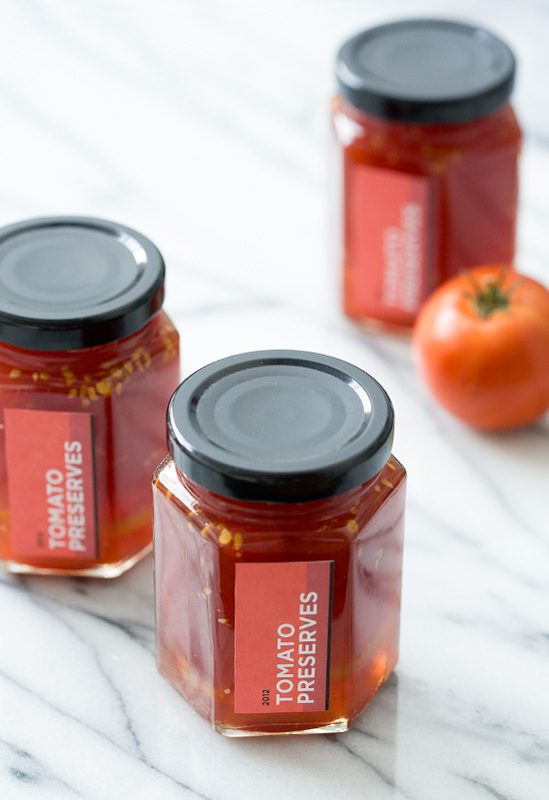 I’m offering these modern jar labels to you, free for personal use. Simply download the printable file, then print onto full-sheet sticker paper (which can be purchased online at OnlineLabels.comor locally at most office supply stores). Cut out the rectangles and apply directly to the the finished jars. These labels should fit most standard mason jars, although if you can find smooth sided jars (ie ones without raised designs on them) that work the best. Curious about the hexagon jars I’ve used? I ordered them online at SKS Bottle (the 6oz size). Disclaimer: Copyright Love & Olive Oil. For personal use only. If you post about or share these labels, please credit appropriately and do not link directly to the downloadable file but rather to this post. Please do not distribute these downloadable files. Thank you much! I can only imagine how good this is! 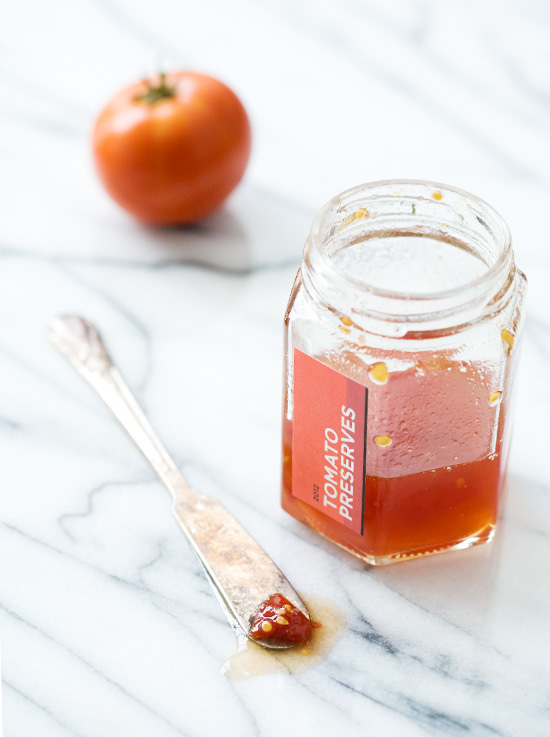 I love tomatoes, and more savory jellies, like hot pepper jelly, so this is right up my alley. Great labels, too! 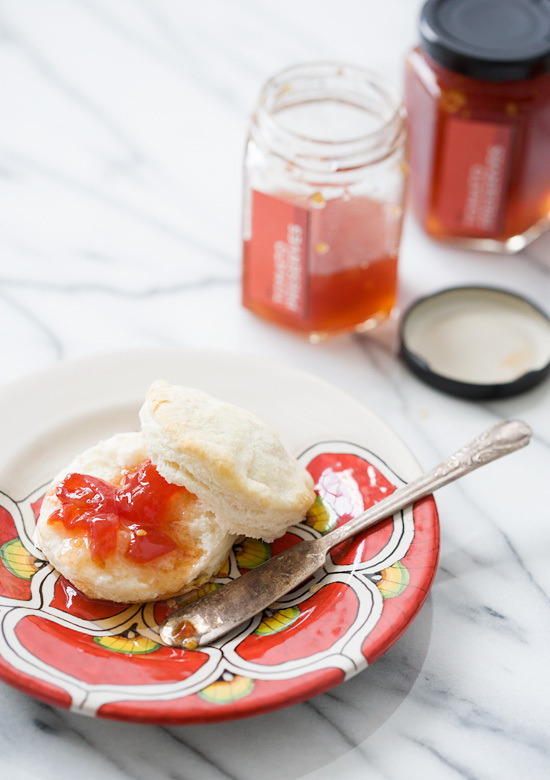 MMmmmm… I love to bottle up summer in the form of this preserves! Maybe it’s a lack of imagination on my part, but I would never think to use tomatoes this way. This looks and sounds delicious! I am SO with you on the biscuit BLT. Yum. Hi- where do you buy these jars from? Love the idea of this on a burger; I’m not going to be able to stop thinking about that! My Mom used to make Tomato Preserves a lot like this but she couldn’t remember how she made them and I was worried I’d never have a chance to try my hand. So big thanks for the recipe and the labels. I’m looking forward to trying this! Yum! This will help the flavors of summer stay fresh throughout the year! Ooh, I could go for that fancy BLT right now! Yum! I love the idea of tomato jam!! Too bad I am way too intimidated by canning to try it on my own… and I blame my small kitchen for not being able to contain the necessary equipment, but it’s really just that I’m terrified. Adding this stuff to a grilled cheese is the best idea I’ve heard in a while!!!! That looks delicious! 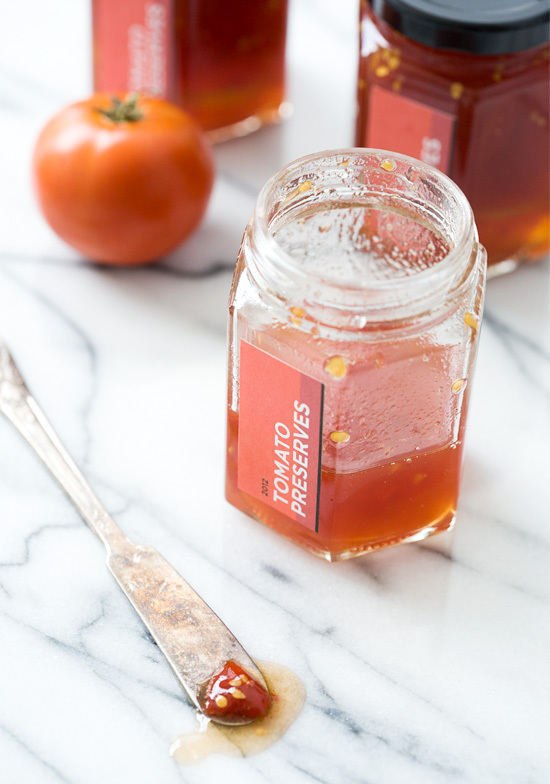 I must admit I’ve never tried tomato preserve but considering how much I love tomatoes I think I’d instantly be hooked. Ooh, those jars really are nifty! But I’m happy to get your rejects! i’m loving your BLT suggestion! 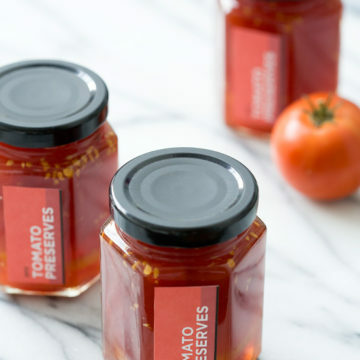 Love the look of this tomato jam ~ and those labels certainly add a unique touch for the holidays! my mum made tomato jelly one year; the colour was a golden iridescent red; the texture beautifully wobbly; and the taste pure amazing tomato. i need to pester her to make it this summer! 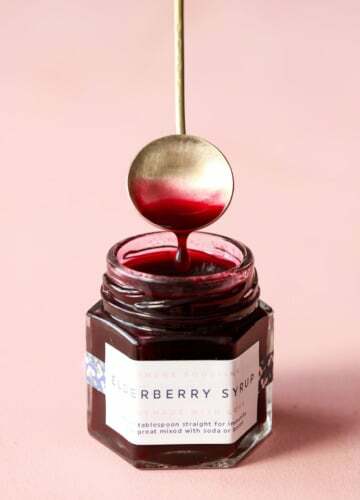 Your jam looks beautiful and I love the labels. :-) Mine was thicker , I am not sure why and my tomatoes were not as chunky. Try is again next year. 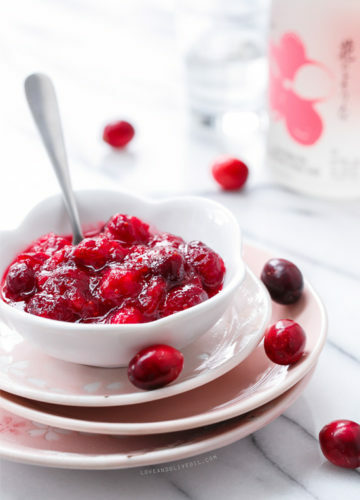 We absolutely love this jam and the unusual flavors. Definitely awesome on biscuits and now that you mentioned it, I need to to make that BLT! If you’re just starting out I’d suggest using the standard 2-piece lids to begin with, just until you get the hang of things. But I did treat these jars much in the same way, and like the 2-piece lids the seal can only be used once. Just finished making these for the second time. Should have followed my instincts on the timing. First batch as directed didn’t set at all. Opened jars after two days and brought it up to 220. Perfect! I grow heirloom tomatoes and several people have asked if I made tomato preserves. Well now I have. Love the taste! Thanks for sharing!